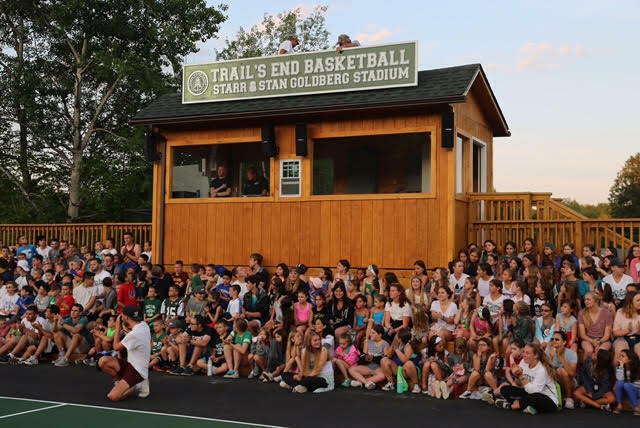 Saturday was a special one for the entire Trail’s End family as we welcomed our campers for the start of our 70th season and then unveiled the new basketball stadium prior to the start of our Opening Campfire. 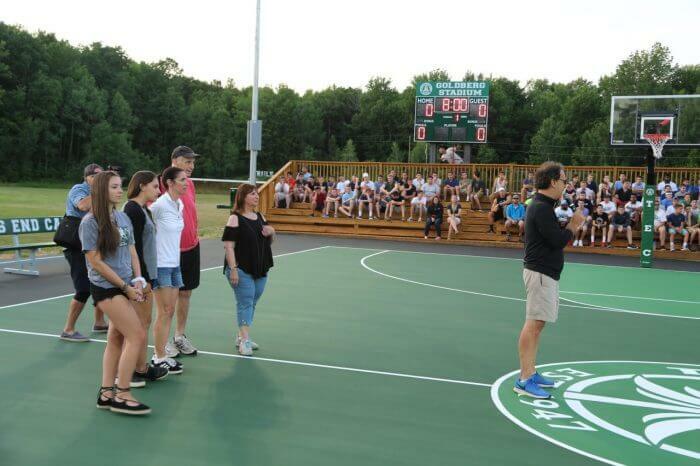 With great pride, Marc announced to the camp that the stadium would be dedicated to Starr and Stan Goldberg. Since the early 1960s, the names Starr and Stan Goldberg have been synonymous with Trail’s End Camp. In 1960, Stan was hired as a counselor at TEC. Two years later Starr joined him. Little did they know, 54 summers later, they would still be here AND they never, ever could have imagined that they would be celebrating this summer as their 30th year of owning Trail’s End, with their children and grandchildren by their side. The Goldbergs make everyone truly feel at home. Their spirit and energy is boundless which is why our secret club is blessed to have this amazing couple leading us each and every day. 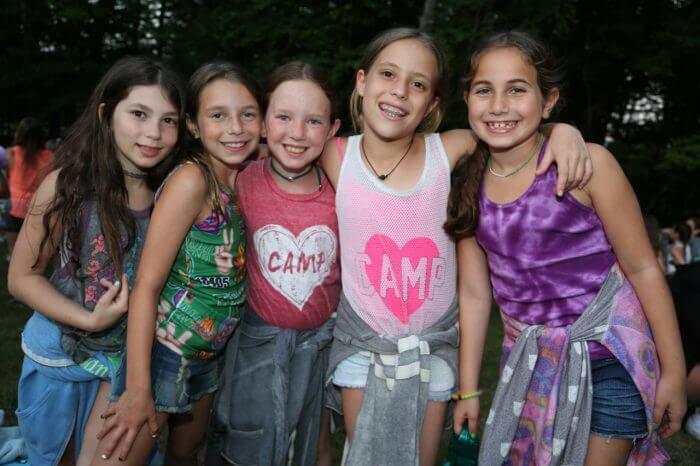 Our camp slogan “better for having been at Trail’s End Camp” can be best felt and seen because of them. All of us are better for having had Starr and Stan Goldberg in our lives. The amazing new basketball stadium, where campers will be shooting hoops and creating memories, has a press box, sound system, lights and a scoreboard. 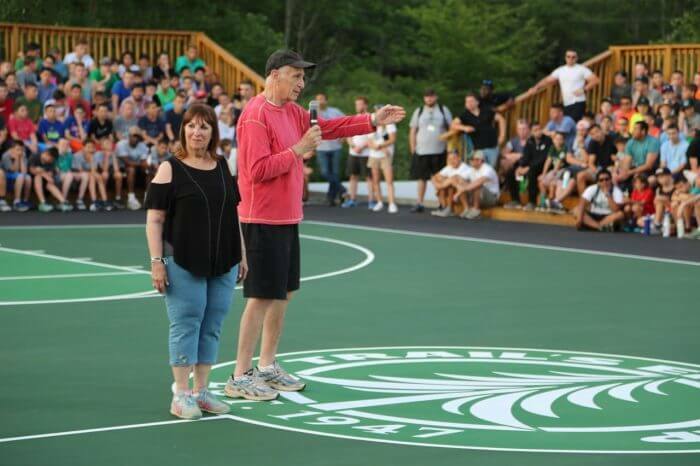 It will be an ever lasting reminder of these two amazing and loving camp icons. This entry was posted in Camper and tagged 18405, Alumni, Camp, Camp Family, Camper, Connections, Family, Friends, Home, Spirit, Summer Camp, Summer Home, TEC, Tradition, Trail's End Camp on June 30, 2016 by Marc Honigfeld. The wait is over! Living ten months for two has finally arrived and Summer 2016 is off to an amazing start! The buses rolled through the 18405 gates straight to the cheerleading pavilion, where campers were reunited with their summer family. Relationships rekindled as the campers sprinted to their assigned bunks where they dropped their bunk junk, to see what the next seven weeks would be all about. First year Varsity slowly walked down the hill, leaving campus behind, ready to take on a new role. The vibes were great. Everyone around was smiling, laughing, just like they had never left. Bagels and lox were soon forgotten, as our traditional pizza lunch was served to get the day going. The rest of the afternoon was followed with everyone’s favorite type of activity, ICE BREAKERS. The day flashed before our eyes and soon enough, the groups starting walking up the hill to opening campfire. The Axelrod Site started as a dance party, playing all the hit summer songs that will be on repeat, ready to take on Summer 16. 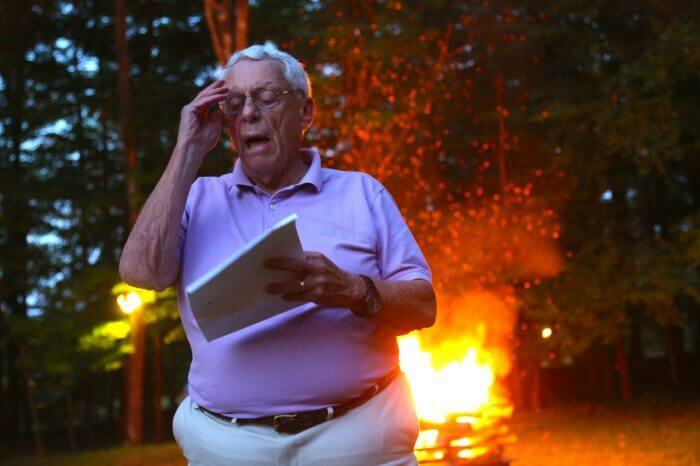 Together for the first time as a family, opening campfire started. After speeches from the leadership team, Steph’s booming voice was heard while he read off each group’s memories from the previous year, as well as his traditional speech, which the returners would not let him recite alone. The Alma Mater was sung, Hello 16’ was lit, and just like that day 1 out of 51 was done. Living without Snapchat and Instagram, the campers jumped right into camp mode ready to wake up to Reveille to start day two, and an experience of lifetime. 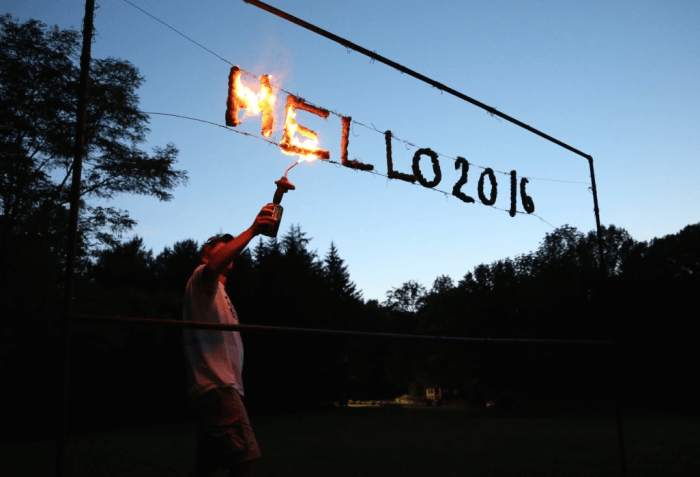 This entry was posted in Camper and tagged 18405, 2016, Camp Family, Connections, Events, Family, Friends, Home, Opening Campfire, Reunions, Sunshine, Traditions, Trail's End Camp on June 26, 2016 by Marc Honigfeld.